After decades of regulation and investment to reduce point source water pollution, OECD countries still face water quality challenges (e.g. eutrophication) from diffuse agricultural and urban sources of pollution, that is disperse pollution from surface runoff, soil filtration and atmospheric deposition. The relative lack of progress reflects the complexities of controlling multiple pollutants from multiple sources, their high spatial and temporal variability, associated transactions costs, and limited political acceptability of regulatory measures. 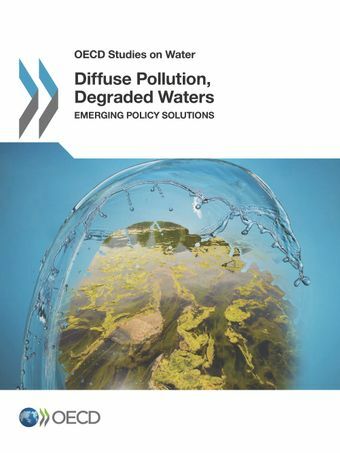 This report outlines the water quality challenges facing OECD countries today, presents a range of policy instruments and innovative case studies of diffuse pollution control, and concludes with an integrated policy framework to tackle diffuse water pollution. An optimal approach will likely entail a mix of policy interventions reflecting the basic OECD principles of water quality management – pollution prevention, treatment at source, the polluter pays and beneficiary pays principles, equity, and policy coherence. Full case studies submitted by member countries and international organisations for this project are presented below. Selected case studies have been included in this report. Several more of the case studies will inform the forthcoming OECD work on contaminants of emerging concern in surface water. infographic - WHAT ARE THE IMPACTS OF WATER POLLUTION? 6 April 2017 (13:00 CET) - OECD Green Talks Live on Degraded Waters: Emerging policy solutions to tackle diffuse pollution - Hannah Leckie and Xavier Leflaive of the OECD Environment Directorate discussed emerging solutions in OECD countries, that can guide the design and implementation of policies to control diffuse water pollution. 22 March 2017 - OECD participation in the World Water Day 2017 Webinar on wastewater organised by International Water Resources Association (IWRA). Details on IWRA press release. Note: Map includes the effects of nutrient and pesticide loading, mercury deposition, salinisation, acidification, and sediment and organic loading. Source: Sadoff et al. (2015); based on data from Vörösmarty et al. (2010).